This tranquil oasis located in the heart of Dubai offers spectacular views, since it overlooks the exciting Meydan Racecourse and iconic Downtown Dubai skyline. 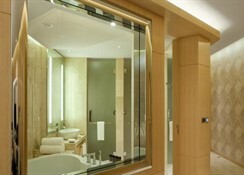 Providing luxury and opulence at every turn, this destination hotel offers to treat you to an unforgettable stay in Dubai. One of the most striking features of this 4-star hotel is its rooftop infinity pool. This chic swimming pool looks out over the racecourse and is set next to a sun-kissed terrace, furnished with elegant loungers and parasols. Guests can also stay active with the in-house tennis academy and the world-class golfing range. Looking for something more in terms of relaxation? Head over to the hotel’s impressive spa and health club, which offer a wide array of indulgent treatments, such as massages, facials and body wraps. Yoga classes are also held twice a week in the mornings, if you want to take part in a rejuvenating sunrise session. The hotel has 284 rooms and suites complete with complimentary Executive Club service – so a quality and comfortable stay will be had by all. 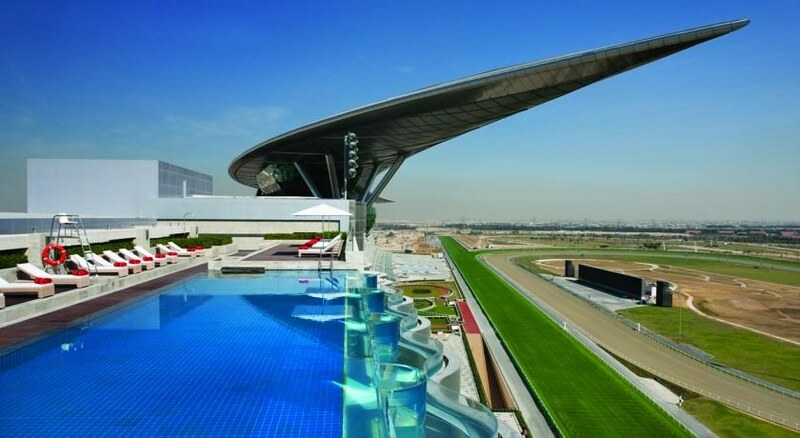 The Meydan Hotel also offers an impressive choice of places to wine and dine, from the popular Prime Steakhouse, to the Asian-inspired venue Shiba. 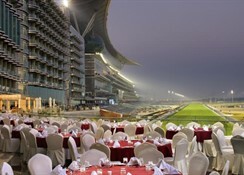 The Meydan Hotel boasts an awe-inspiring location, sitting in Bur Dubai, next to the Meydan Racecourse. Guests can lose themselves in the hotel's away-from-it-all feel, or get out and explore the local attractions, all of which are within easy reach. 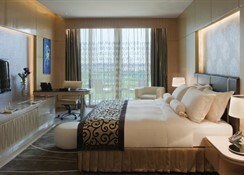 The Mall of the Emirates, Burj Khalifa, the beach and the Jumeirah Mosque are all within 20 minutes of the hotel. The Dubai International Airport is about 12km from the hotel. 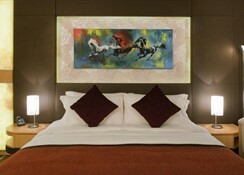 The Meydan Hotel boasts 284 fashionable and luxurious rooms, with modern décor and elegant furnishings. These rooms are classified into six categories – Executive Room, Grand Premium Balcony Room, Grand Deluxe Balcony Room, Panoramic Suite, Presidential Meydan Suite and Presidential Duplex Suite. Every room offers superb views over the racecourse, with a private balcony. Each room also comes with air conditioning, LCD TV, DVD player, WiFi internet, a mini bar, tea & coffee maker, a safe, telephone and a private bathroom. Providing 24-hour concierge service, the hotel is always dedicated to serving the needs of the guests with utmost commitment. 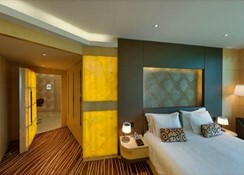 Guests can enjoy comprehensive business support at the business centre. Guests are spoiled for choice when it comes to food and drink, with several restaurants and bars offering cuisines from across the world. 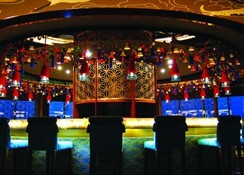 The Prime Steakhouse boasts fine meats, whilst Shiba offers modern Japanese and Chinese specialities. The Farriers International Restaurant offers international cuisine, with live food stations so you can watch the chefs prepare your meals. Drinks are available in the superbly decorated Millennium Lounge, in the cosy Siba Bar and beside the water at the poolside Equus Bar. The Meydan Hotel offers an abundance of activities and leisure options, whether you want to relax, keep fit or have fun with your friends. Those looking for something a little different can try some Aikido martial arts lessons or improve their aim in the shooting simulator. Guests who wish to enjoy exercising outdoors can play tennis, badminton or volleyball on the courts. Golf enthusiasts can head over to the on-site golf course and tee off to their heart’s content, additional charges may apply. Please note: extra beds for children are available at extra charge and need to be requested directly at the hotel or by contacting the Customer Service. Though traffic circumstances are beyond our control, we make every efforts to adhere to above schedule.